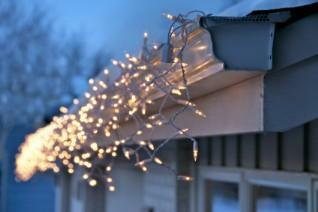 Use plastic clips to attach light strands to gutters. When it comes time to install your outdoor Christmas holiday lighting, it may seem like a piece of cake. After all, as long as you have lights and an outlet, how hard could it be? Taking the time to check equipment, measuring, and following safety procedures could mean the difference between an injury and beautiful decorated front yard. Before you start installing your Christmas lights, you should check all of your equipment to ensure safety. The first thing to review is our outdoor electrical outlets. They should be protected by a ground fault circuit interrupter (GFCI or GFI) that allows for a three-pronged plug to be used. Portable ones can be purchased if your outlets do not have one. Consult an electrician before installation. Next, check old light strands. Look for bad bulbs and worn insulation. Replace any burnt bulbs with a bulb of the same wattage. Be sure to unplug your lights first. If the insulation is worn or cut, throw away the entire strand. Worn insulation is a fire hazard and paying for a new string of lights is much better than a house fire. Buy replacement strands that are marked for outdoor use and designated UL or ETL. Finally, make sure you have a sturdy ladder. Rungs should not be cracked. Get a friend to help steady the ladder and help hang your lights. Buy plastic hanging clips for lights that will be on homes; stapling or nailing to the house could damage insulation and create a fire hazard and be hard to remove. Proper measurement is key when it comes to doing an install of outdoor Christmas holiday lighting. Measure where you need the lights to hang, adding in an extra 30 feet. Take note of where the outdoor outlets are around your home, and try to buy strands in lengths that will reach these outlets. Because it is usually not recommended to string together more than three strands at once (check manufacturer's instructions), you want to get the right length strands. For covering shrubs, bushes, and tree trunks, consider getting netted lights or wraps, which save time and look festive. Be sure to check on the length of extension cord you will need to get. Do not buy a longer cord than needed, and use wire stakes to keep it near the ground so family and visitors do not trip. Check city ordinances for any outdoor lighting codes or ordinances. Have a friend or family member help for safety. Read and follow manufacturer's instructions for all lights. If your ladder cannot reach the top of an outdoor Christmas tree, do not climb above ladder manufacturer's warning rung. Instead, borrow a ladder from a neighbor or simply wrap the trunk in lights. Use plastic clips, not nails or staples, to attach lights to home. Support your strands with a hook every couple of feet. Do not hang near sources of heat, like a dryer vent. Do not put an extension cord or light cord through a closed window or door, as it may hurt insulation. Unplug lights overnight or when you are not home. Take lights down at the end of the holiday season. Not doing so can fray the wiring and cause damage. Outdoor Christmas decorations with lights can make your December electricity bill significantly higher. You may want to install outdoor Christmas holiday lighting on a timer for two reasons: One is for safety, as they will automatically turn off at the end of the evening; the other is to help keep your electricity costs down. Homes without outdoor electricity can be modified to get outdoor lighting. Check with your electric company and a certified electrician to get your home ready for the holidays.